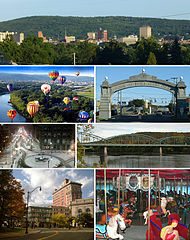 Binghamton can be found in the southern part of the state of New York near the border with Pennsylvania. The city is basically located in a bowl-like valley between the Chenango and Susquehana Rivers. This city is the center of the Binghamton metropolitan area, and it is currently home to just under 50,000 people. The early years of this historic city were based around being a transportation hub in the age of the railroad and having a large number of manufacturing plants. Find auto insurance in Binghamton, NY. The biggest attraction in this city is the Recreation Park Carousel. Not many kids get to grow up in a city that has a carousel in a local park, and this part of the city is able to offer the perfect amount of nostalgia to visitors from all over the world. The Discovery Center is an option if you are bringing some kids to the city because it is one of the premier children’s museums in the area. This town is filled to the brim with museums, and you may want to look into the Roberson Museum and Science Center, Bundy Museum of History and Art, or the Phelps Mansion Museum if you are interested in history or the arts. When you are driving around Binghamton, it’s important to make sure that you have insurance. Even if you are the best driver in the world, you never know when bad luck could be right around the corner. Take a look at the quotes available on newyorkmotorinsurance.com if you need help finding the best deal. At Phelps Agency, our goal is simple; to provide customized products at a competitive price and to maintain your trust with superior customer service.